Smoked Salmon, Sweet orange, peppery leaves, fresh herbs and creamy avocado. 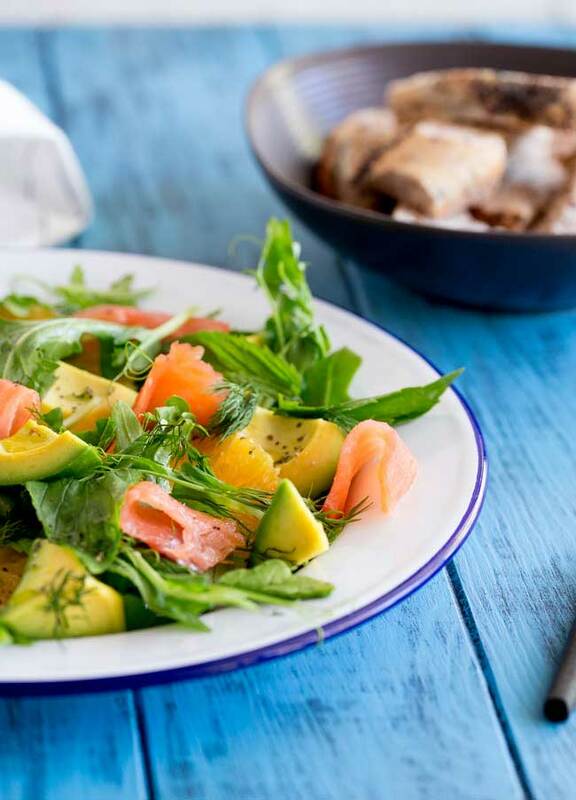 This smoked salmon, orange and avocado salad is packed with flavours and textures. So delicious and so beautiful it is sure to become a firm favourite. The combination of smoked salmon and orange may sound a little strange but it works so fabulously well. You have the sweet orange and the salty salmon – that is flavour combination perfection!!!! Especially when teamed with the lemon and orange dressing and the punch from the rocket (arugula). The dressing uses the zest of your orange and then the juice of a lemon so it pulls together all the citrusy flavours and really makes everything sing. Don’t be put off by making your own dressing. Just a few ingredients, a good whisk and you have something so fresh and miles away from the store bought stuff! I love the word arugula, I wish it was what we used here in Australia. Rocket just doesn’t sound quite as beautiful!!! But whatever you call it, it does have a wonderful peppery heat that works so well in this salad. My friends down the road are avid homesteaders, they have so many garden beds full of fresh herbs, leafy greens and a vast variety of vegetables. Their rocket/arugula is amazing!!! It isn’t the mild baby rocket that you buy in those lettuce pillows from the grocery store. This is full on fiery pepper and heat. SOOOOO GOOD!!!!! But sadly a bit too much for this salad. You want the milder baby leaves as they work perfectly with the other flavours!!! When I made this salad avocados were on special at my supermarket, obviously I bought those!!!! But they were the yellower shepard variety rather than my usual hass. They taste beautiful, so creamy, just like a treat in vegetable form 😀 But I do think the paler hass variety may have looked better. But hey, food is about flavour and you cannot knock this salad for that. You want an avocado that is just ripe, it wants to have enough bite to hold it’s shape in the salad. No mushy bits here. The beauty of this salad is in the crispy flavours and gorgeous colours. Seriously just look at it. Stunning colours that just look like art on a plate! 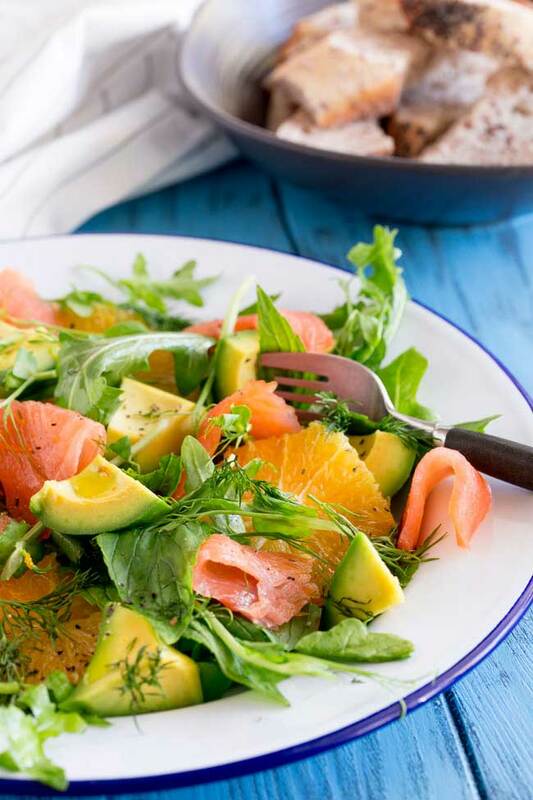 Grab a fork and dig into this Smoked Salmon, Orange and Avocado Salad today! 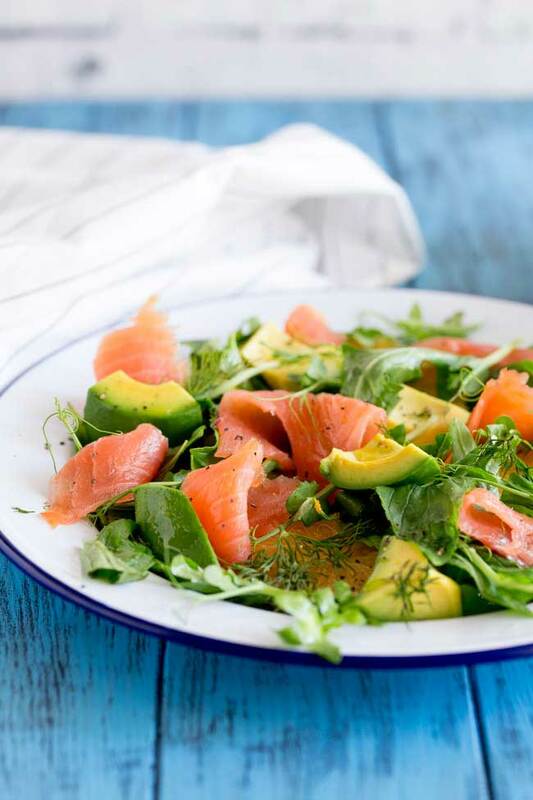 I really am in love with these photos of my Smoked Salmon, Orange and Avocado Salad!!! I did a little bit of a squeal when I pulled them off my memory card and onto my laptop. They looked exactly how I wanted them too. Fresh, summery and with an outdoor eating kind of vibe. Which is perfect for the warmer weather coming to the northern hemisphere. Here in Australia we are heading into fall (which is my favourite time of year!!!!) 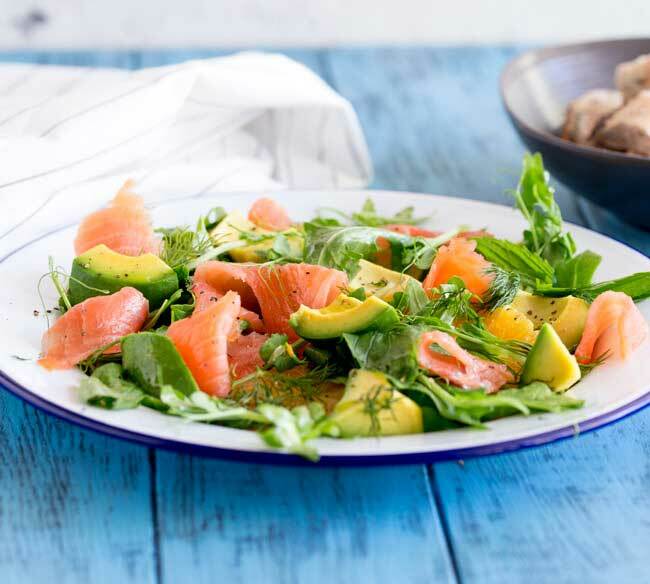 but thanks to our beautiful climate we are still having bright, sunny beach days so this Smoked Salmon, Orange and Avocado Salad makes the perfect lunch! I really wanted to put some blood oranges into this salad, but they are really hard to find here. So standard navel oranges did a great stand in. Flavour wise it will make very little difference, but I love the bright crimson of blood oranges. I also wondered about charring my orange slices. (as we all know I have a charred lemon addiction!!!) but in the end I left this all simple, fresh and completely delish! I used some sweet fresh mint, the slightly aniseed flavoured dill and then to add a great fresh pop, some pea shoots. But to be honest you could mix that up a little, as fresh parsley would be fabulous too. 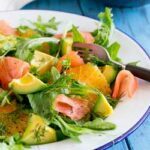 This Smoked Salmon, Orange and Avocado Salad is my contribution to this weeks #SundaySupper. This week we are celebrating seafood!!! 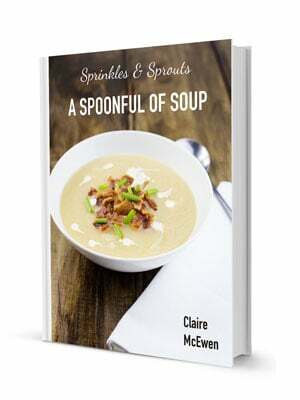 I am so excited to share some of the recipes with you. Check out the end of my recipe to see links to all the other Sunday Supper peeps and their recipes. This salad serves 4 people generously. Add some bread and a glass of wine and you have a pretty perfect weekend lunch! 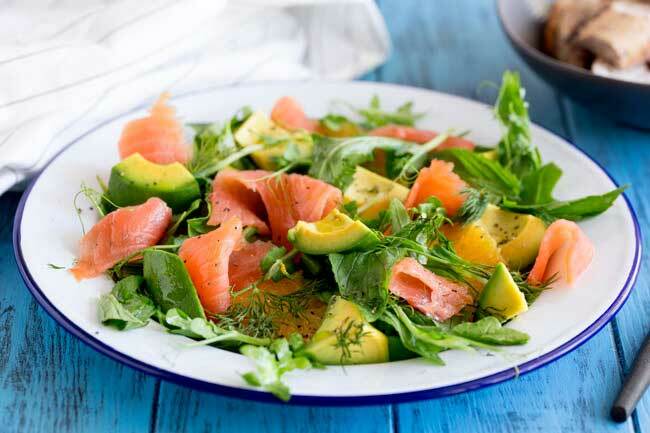 Aren’t the colours in this Smoked Salmon, Orange and Avocado Salad just amazing!!! So fresh and beautiful! But I guess I should post a recipe. 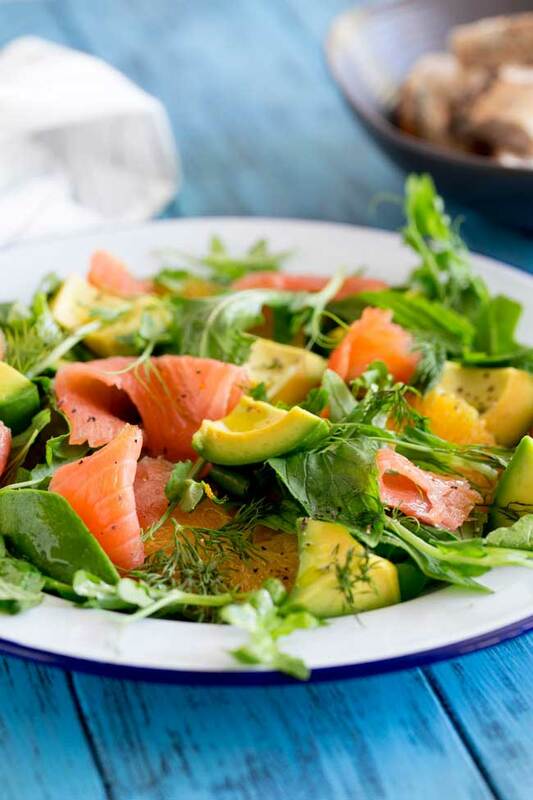 If you love this recipe for Smoked Salmon, Orange and Avocado Salad why not pin it for later. Zest your orange and put the zest into a small jug or bowl. Cut the ends off the oranges and then use a sharp knife to cut the skin and pith off the oranges. Carefully cut the oranges into thick slices and set aside. Pour any juice that collected on your chopping board into your zest. Add the extra virgin olive oil into your zest and then add the lemon juice. Season with a pinch of salt and whisk well to combine. Mix the rocket/arugula, snow pea shoots, fresh mint and fresh dill together and then pour over the dressing. Once the leaves have been coated, sprinkle them over a large plate. Arrange the smoked salmon in and around the leaves. Cut the avocado in half, remove the seed and the skin and then cut into large chunks. Add this to the salad and serve immediately. 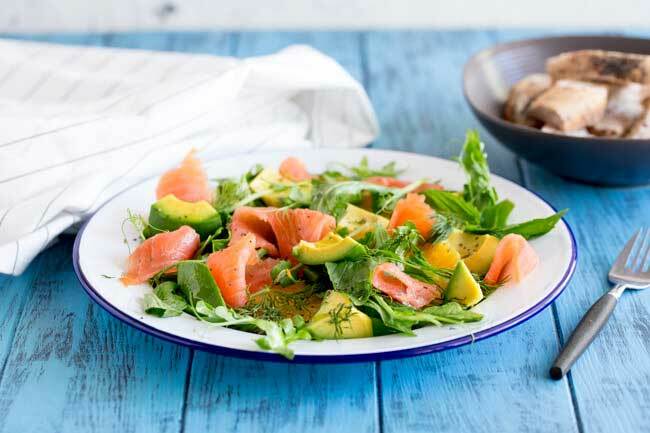 If you love food why not subscribe to my newsletter, I will drop you an email every now and then, just to say hi and send you a couple of recipes think you might love, like this Smoked Salmon, Orange and Avocado Salad. All those colors, flavors, and textures look amazing! So beautiful and perfect for spring.